Dewey was born in Adams Center, New York, the fifth and last child of Joel and Eliza Greene Dewey. He attended rural schools and determined early that his destiny was to reform education of the masses. He briefly attended Alfred University (1870), then Amherst College, where he belonged to Delta Kappa Epsilon, and from which he earned a bachelor's degree in 1874 and a master's in 1877. While still a student, he founded the Library Bureau, which sold high-quality index-cards and filing-cabinets, and established the standard dimensions for catalog cards. As a young adult he advocated spelling reform; he changed his name from the usual "Melville" to "Melvil", without redundant letters, and for a time changed his surname to "Dui". From 1883 to 1888 he was chief librarian at Columbia University. During his time as director of the New York State Library (1888–1906) Dewey established a program of traveling libraries. From 1888 to 1900 Dewey served as secretary and executive officer of the University of the State of New York. In 1895 Dewey founded the Lake Placid Club with his wife Annie. He and his son Godfrey had been active in arranging the Winter Olympics which took place at Lake Placid—he chaired the New York State Winter Olympics Committee. In 1926 he went to Florida to establish a new branch of the Lake Placid Club. Dewey married twice, first to Annie R. Godfrey, and then to Emily McKay Beal. He and his first wife had one child, Godfrey. Dewey became a member of the American Library Association's Hall of Fame in 1951. He died of a stroke in Lake Placid, Florida. Dewey was a pioneer in American librarianship and an influential figure in the development of libraries in America in the late 19th and early the 20th century. He is best known for the decimal classification system that many public and school libraries use. Among his other innovations was the idea of a state library operating as the controller of the state's school and public library services. In Boston, Massachusetts, he founded the Library Bureau, a private company "for the definite purpose of furnishing libraries with equipment and supplies of unvarying correctness and reliability." Its investigative unit, devoted to studying the best practices of library loss-management, circulation and data retention, recovered 3,000 books in its first year of existence. Dewey's Library Bureau company is also said to have introduced hanging vertical files, first seen at the Columbian Exposition of 1893 in Chicago. In 1905, Dewey established the American Library Institute which was an organization conceived to provide for the investigation, study and discussion of issues within the field of library theory and practice. Spine labels showing Dewey Decimal Classification call numbers. Immediately after receiving his undergraduate degree he was hired to manage Amherst's library and reclassify its collections. Dewey worked out a new scheme that superimposed a system of decimal numbers on a structure of knowledge first outlined by Sir Francis Bacon. For his decision to use a decimal system he may have been inspired by two library systems that he includes in the acknowledgements in the first publication of his system in 1876. In that preface, and in the following thirteen editions, Dewey cites the card system of Italian publisher Natale Battezzati as "the most fruitful source of ideas". Dewey copyrighted the system in 1876. This system has proved to be enormously influential; though many American libraries have since adopted the classification scheme of the Library of Congress, Dewey's system remains in widespread use. In 1877 Dewey moved to Boston, where he founded and became editor of The Library Journal, which became an influential factor in the development of libraries in America, and in the reform of their administration. He was also one of the founders of the American Library Association, of which he was secretary from 1876 to 1891, and president in 1891 and 1893. Interior of the New York State Library, late 19th century. 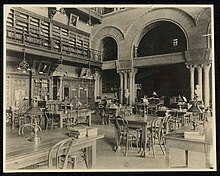 In 1883 Dewey became librarian of Columbia College, and in the following year founded there the School of Library Economy, the first institution for the instruction of librarians ever organized. The proposal to establish the school was approved by the college's Board of Trustees on May 5, 1884. After a period of preparation, the school was officially opened on January 5, 1887, with an enrollment of 20 students—three men and 17 women. Women were admitted to the program at Dewey's insistence and against the wishes of the college's Regents. Although the school had a promising start, Dewey's conflicts with the university officials, in particular over the issue of the presence of women, led to its future being cast in doubt, and by 1888 it was apparent that Columbia intended to close it. However, at that point, Dewey, upon accepting a position with the New York State Library in Albany, successfully secured the agreement of its Regents to have the school transferred there. The formal transfer was accomplished in 1889, and the school, which was ultimately very successful, was re-established in Albany as the New York State Library School under Dewey's direction. (The school returned to Columbia's Manhattan campus in 1926.) Dewey did not forget his Columbia students. He petitioned the University of the State of New York, which granted degrees to those students who agreed to submit to examinations and produce a bibliography and thesis. Two students participated, including future ALA registrar and college archivist Nina Browne. During the period from 1888 to 1906 Dewey was also director of the New York State Library, and until 1900 he was secretary of the University of the State of New York as well. In that function he completely reorganized the state library, making it one of the most efficient in America, as well as established the system of state travelling libraries and picture collections. In 1885, he founded the New York Library Club there. Community libraries began to flourish in the early nineteenth century. The West opened to expansion and further exploration, and people wanted services and opportunities to move with them. In New York, Melvil Dewey had "initiated a program of traveling libraries-collections of one hundred books sent to communities without public libraries." His efforts spurred other state organizations and private individuals to create traveling libraries. Increased library services to small or rural communities and underserved populations fortified the efforts of many to seek out education and self-improvement. As an enthusiastic supporter of the decimal metric system of weights and measures, Dewey established in 1876 the American Metric Bureau. Dewey also served once again as its secretary. He edited the Bureau's official publication, the Metric Bulletin (later called Metric Advocate), first issued in July 1876. Later in his life he was member of the Advisory Board of the All-America Standards Council (a California-based organization that promoted metrication for all countries in the Americas) and he functioned as member of the Advisory Board and chairman of the Metric Education Committee in the American Metric Association (today the U.S. Metric Association). Lake Placid from the Whiteface Mountain gondola. Late in his life Dewey helped found the Lake Placid Club as a health resort in New York state. Spelling Reform: His theories of spelling reform (to which end he founded the Spelling Reform Association in 1886) found some local success at Lake Placid: there is an "Adirondak Loj" in the area, and dinner menus of the club used his reformed spelling. A September 1927 menu is headed "Simpler spelin" and features dishes like Hadok, Poted beef with noodls, Parsli or Masht potato, Butr, Steamd rys, Letis, and Ys cream. It also advises guests that "All shud see the butiful after-glo on mountains to the east just before sunset. Fyn vu from Golfhous porch." Other Reforms: Lake Placid also acted as a conference center hosting meetings promoting reform movements, such as the September 1899 conference on "home science" chaired by Ellen Swallow Richards, a pioneer of what later came to be called "home economics". Dewey was an early promoter of winter sports in Lake Placid and was active in arranging the 1932 Winter Olympics there. He also was a founder of the Lake Placid Club Education Foundation in 1922. Under his leadership the Northwood School (Lake Placid, New York) prospered. He was also a founder of the Adirondack Music Festival in 1925, and served as a trustee of the Chautauqua Institution. In 1926 he established a southern branch of the Lake Placid Club in Florida. Dewey supported the idea of Lake Stearns in Florida formally changing its name to Lake Placid, Florida. Dewey established a pattern of making powerful enemies early in life, and many of his friends found him difficult as well. As one biographer put it, "Although he did not lack friends, they were becoming a little weary of coming to his defense, so endless a process had it become." Another biography refers to Dewey's "old nemesis—a persistent inability to control himself around women" as a chronic cause of trouble on the job. For decades, Dewey engaged in “unwelcome hugging, unwelcome touching, certainly unwelcome kissing” with women subordinates and others, according to biographer Wayne A. Wiegand. When Dewey opened his School of Library Economy at Columbia College to women it was rumored that he asked for their bust sizes with their applications. Though the rumor turned out to be false he did require a photograph from each female applicant since "you cannot polish a pumpkin". In 1905 during a 10-day trip to Alaska sponsored by the American Library Association (ALA), a group he co-founded, he made unwelcome advances on four prominent librarians who informed Association officials. As a result, Dewey stepped down from active participation in the ALA. Reports, allegations, and an investigation of Dewey's inappropriate and offensive behavior directed at women continued for decades after his departure from ALA. In 1930, he paid $2,000 to settle a lawsuit by a former secretary alleging sexual harassment. The Lake Placid Club banned Jews, blacks, and others from membership, a policy written by Dewey. In 1904 the New York State Board of Regents received a petition demanding Dewey's removal as State Librarian because of his personal involvement in the Lake Placid Club's policy of excluding Jews and other religious and ethnic groups. While the Regents declined to remove Dewey, they did issue a public rebuke, and in the summer of 1905 he resigned as a result. 1876: Classification and subject index for cataloguing and arranging the books and pamphlets of a library, Hartford, Conn.: Case, Lockwood, & Brainard Company (44 pages). 1885: Decimal classification and relative index for arranging, cataloguing, and indexing public and private libraries and for pamphlets, clippings, notes, scrap books, index rerums, etc. : Second edition, revised and greatly enlarged. Boston: Library Bureau (314 pages). 1886: Librarianship as a profession for college-bred women. An address delivered before the Association of collegiate alumnæ, on March 13, 1886, by Melvil Dewey. Boston: Library Bureau. 1887: Library notes: improved methods and labor-savers for librarians, readers and writers. Boston: Library Bureau. 1895 Abridged decimal classification and relative index for libraries. Boston: Library Bureau. 1898: Simplified library school rules. Boston, London [etc. ]: Library Bureau. 1889: Libraries as related to the educational work of the state. Albany. 1890: Statistics of libraries in the state of New York numbering over 300 volumes. Albany. 1894: Library school rules: 1. Card catalog rules; 2. Accession book rules; 3. Shelf list rules. 1904: A.L.A. catalog Washington: Government Printing Office. This article incorporates text from a publication now in the public domain: Chisholm, Hugh, ed. (1911). "Dewey, Melvil" . Encyclopædia Britannica. 8 (11th ed.). Cambridge University Press. p. 139. ^ Wedgeworth, Robert (1993). World Encyclopedia of Library and Information Services (3rd ed.). Chicago: America Library Association. p. 250. ISBN 0838906095. ^ Anna Elliott (May 1981). "Melvil Dewey: A Singular and Contentious Life" (PDF). Wilson Library Bulletin. Archived from the original (PDF) on October 10, 2008. ^ Michael Dewe (1968), "Historical aspects of library supply". In: Library World Vols 70–72, Grafton (eds), pp. 27–28. ^ a b "Melvil Dewey dead in Florida", The New York Times, December 27, 1931. ^ a b c "DEWEY, MELVIL (1851–)", in: Encyclopædia Britannica (Eleventh ed. ), Chisholm, Hugh, ed. (1911), Cambridge University Press. ^ Jim Scheppke, State Librarian (2005). Origins of the Oregon State Library Archived April 10, 2009, at the Wayback Machine. Written on the occasion of the celebration of the State Library Centennial, January 27, 2005. Retrieved June 30, 2008. ^ a b c "Library Bureau – Our Legacy". Archived from the original on July 13, 2011. Retrieved July 4, 2011. 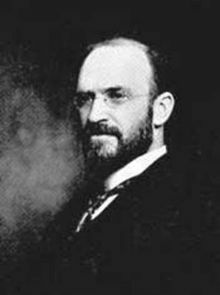 ^ Lee, Michael M. Melvil Dewey (1851–1931): His Educational Contributions and Reforms. 1979. Print. ^ Erik Larson (2003). Devil in the White City. ^ Wiegand, W. A. (1998). "The "Amherst Method" : The Origins of the Dewey Decimal Classification Scheme". In: Libraries & Culture. Vol. 33, No. 2, Spring 1998. ^ Comaromi, John Philip. The eighteen editions of the Dewey Decimal Classification. Albany, Forest Press Division, 1976. p. 10. ^ Classification and Subject Index for Cataloguing and Arranging the Books and Pamphlets of a Library, Amherst, Mass., 1876. p. 10. ^ Sarah K. Vann. Training for Librarianship Before 1923. Chicago: American Library Association, 1961. p. 28. ^ Richard E. Rubin, Foundations of Library and Information Science. 3rd edn. New York: Neal-Schuman, c2010, p. 81. ^ Saxon, Wolfgang, "Columbia to Close Library", The New York Times, June 6, 1990. ^ Biographical Note, Nina Elizabeth Browne Papers, 1860 – 1954, Smith College Archives, http://asteria.fivecolleges.edu/findaids/smitharchives/manosca384.html (accessed August 5, 2016). ^ Murray, S. A. (2012). The Library: An Illustrated History. New York: Skyhorse Publishing. ^ The Library History Buff. "Melvil Dewey's Library Bureau". ^ Children of the Code. " Background Research Notes: CODE REFORM (ATTEMPTS) HISTORY". ^ Hector Vera, "Melvil Dewey, Metric Apostle", MetricToday: The U.S. Metric Association Newsletter, vol. 45, no. 4, July–August 2010, pp. 1, 4–6. ^ Richards, Ellen H., ed. (1901–1908), Lake Placid Conference proceedings, Lake Placid Conference, Lake Placid, NY: American Home Economics Association . ^ Rider, Fremont (1944), Melvil Dewey. American Library Association, p. 105. ^ Ford, Anne (June 2018). "Bringing Harassment Out of the History Books". American Libraries. American Library Association. Retrieved June 27, 2018. ^ a b c d Kendall, Joshua. "Melvil Dewey: Compulsive Innovator". American Libraries Magazine, 2014. ^ Garrison, Dee (2003). Apostles of culture : the public librarian and American society, 1876-1920. Madison: University of Wisconsin Press. p. 280. ISBN 9780299181147. OCLC 50285121. ^ "The Father of Modern Libraries Was a Serial Sexual Harasser". HISTORY.com. Retrieved January 8, 2018. ^ Citizen (1905-02-15). "STATE LIBRARIAN DEWEY. ; The Real Issue Involved in the Demand for His Removal". The New York Times. ISSN 0362-4331. Retrieved 2019-02-14. ^ Silver, M. M., Louis Marshall and the Rise of Jewish Ethnicity in America. Syracuse University Press, 2013. ISBN 978-0-8156-1000-7, pp. 90–97. ^ Times, Special to The New York (1905-02-16). "STATE LIBRARIAN DEWEY IS REBUKED BY REGENTS; Must Quit Countenancing Anti-Jewish Campaign or Resign. ACT IN LAKE PLACID CASE Dewey Repeats Promise to Give Up Trusteeship of Club Which Issued Circulars Offensive to Jews". The New York Times. ISSN 0362-4331. Retrieved 2019-02-14. American Library Association (1993). World encyclopedia of library and information services (3rd ed.). Robert Wedgeworth. pp. 250–253 of 905. ISBN 0838906095. Wikimedia Commons has media related to Melvil Dewey. This page was last edited on 19 March 2019, at 11:18 (UTC).